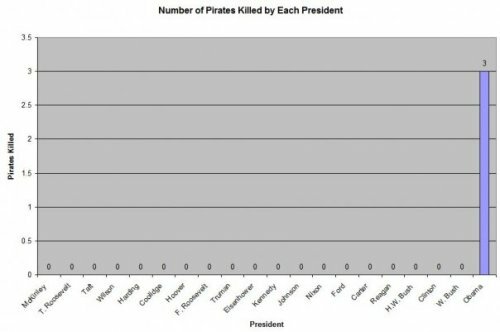 Actually, this chart conveniently leaves off Thomas Jefferson, who waged war against the "Barbary states", which supported pirates, so presumably pirates were killed because of Jefferson's actions. Still, the rescue of Capt. Richard Phillips by US Navy SEAL snipers is clearly a victory for Obama that is rare among US Presidents. | In Pics, Fun | on Apr 13, 2009	| by joshmorgan | 58 words, . I don’t know if I feel too comfortable celebrating the death of pirates. There’s no doubt that Capt. Phillips is incredibly brave, but I just wish that it could’ve been done without any casualties. I’ll start cheering for the army that doesn’t kill, or one with fewest casualties… maybe the U.S. military needs to play some more Metal Gear Solid and less Call of Duty, know what I mean?